According to news reports, in the past few years scientists have been able to splice a gene into a rose to make a "blue" rose. Well, call me cynical, but every picture I've seen of the so-called blue rose looks a whole lot like a lavender-colored rose. I saw no true BLUE roses in any of the photos. And anyway, genetically modified anything is a bad idea in my book. So I set out to make my own true blue Dapper Denim rose.....no gene splicing needed! And *BONUS* I can guarantee that it will never wilt, draw pests, or mess with your own personal biology. After I spliced colored this rose, I colored up some more roses with the other In Colors. But not Emerald Envy, though. 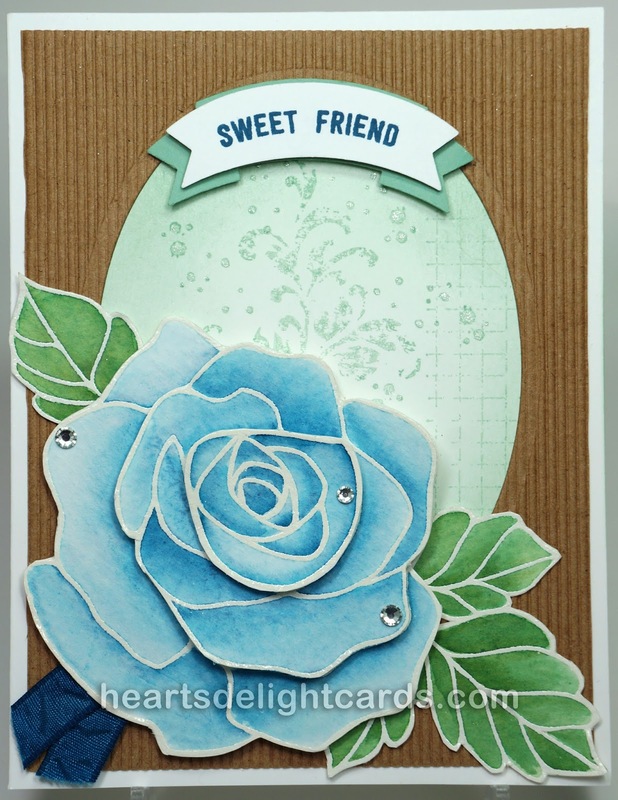 A green rose would look as odd as a truly blue one, wouldn't it? Sorry, I'm too tired to do a detailed "how-to" for this card. 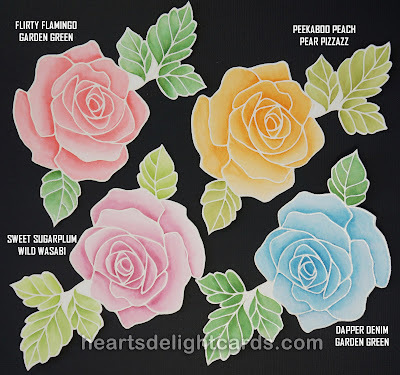 I heat embossed the rose three times on watercolor paper with white embossing powder, colored them with an Aqua Painter, and fussy cut them. Popped layers on Dimensionals. Corrugated paper** is 4" x 5-1/4", cut with Oval** die (counting fifth from smallest). Sponged Mint Macaron on white card base, stamped with same (stamped off) using Timeless Textures. Punched detailed banner on Duet Banner* punch in Mint Macaron, plain banner in Whisper White. Stamped greeting in Dapper Denim* using Thoughtful Banners*.